1. Airsoft Elite MP5 SD. History: Bought it about 6 months ago from Rick Kastner from Kastway airsoft. I've put about 2,000 rounds through it, never one problem. Gun is without a doubt, the best gun I've ever owned. 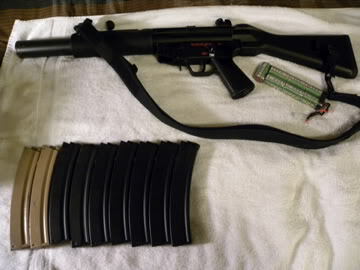 Only problem, SEALs no longer use the MP5, so, it's got to go. What it comes with: 9 mags. 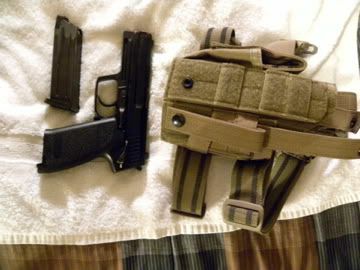 1 AE high cap, 8 mag midcaps ( two are painted tan), also comes with an ICS two point sling, and an 8.4 4200 Intellect battery. 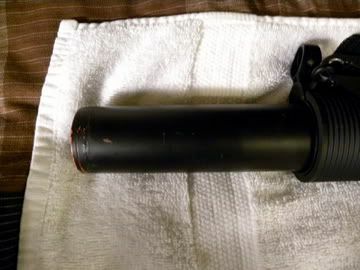 The suppressor has also been spray painted black. Has a little bit of orange left, just for safety. Problems: None. Gun is just about perfect internally and externally. Price: Asking $350. Trades would be a high end M4 with an RIS system and a crane stock. 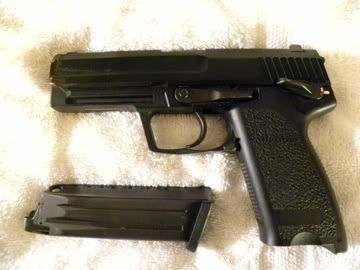 History: Bought this pistol about one year ago from Mike's Army Store. Excellent pistol, but again, not SEAL issue. Put maybe 1,000 rounds through it. 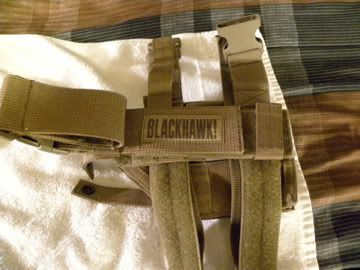 What it comes with: Gun, 1 mag and a Blackhawk left handed thigh holster. Problems: Slide is a little slow, and the paint job on the tip is a little runny, but works fine. 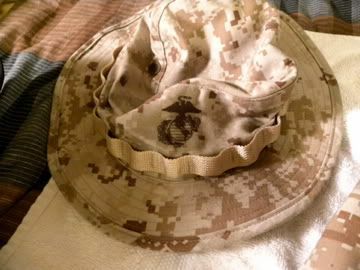 Propper USMC Desert MARPAT Uniform. 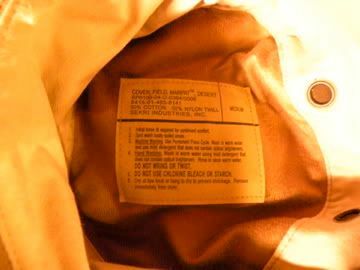 History: Bought from M&J's Army Surplus brand new about 1 year ago. 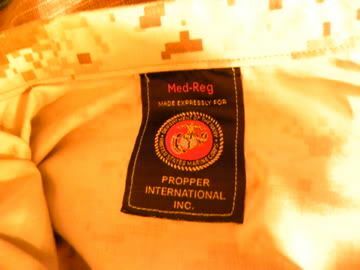 This uniform is standard USMC issue and has the Eagle, Globe, and Anchor USMC logo on Cover, Blouse and Trousers. What it comes with: Boonie hat, size Medium, Blouse, size Medium regular, and trousers, size medium regular. If you're not familiar with these sizes, I'm 6' 1", about 150 lbs, light build, and these fit a little loosely. Problems: Have some dashes of white paint on the back, but when wearing a vest, you can't even tell it their. Even without the vest, it blends in pretty well. Price: Asking $100 or trade for a uniform of equal value in three color desert, preferably with velcro already on it. 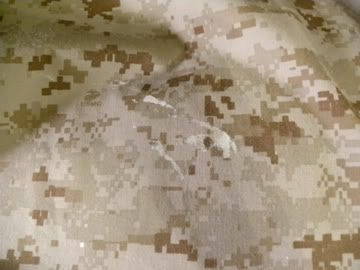 (this pic shows the white paint smear). More pics available upon request. I'm located in Granbury, TX, and would prefer to meet locally, however, if you have positive feedback, we can work something out. Alright guys, that's about it. Any questions, post, PM or call me at 817-894-1676. Thanks for looking.